Gioni, M. (2007) Ask The Dust. Flood, R. Hoptman, L. Gioni, M (Ed.) (2007) Unmonumental – Object in the 21st Century. London, England: Phaidon Press. I found this essay by M. Gioni to be a very good precis of the changes in sculptural practice from classical form to 21st Century object based works. It extends my understanding from Rosalind Krauss’s writing on the Extended Field into contemporary practice. Gioni starts much as Krauss did, discussing the tradition of sculpture as tied to the monumental; statues of remembrance, funerary monuments, depictions of people and things past or legendary. It’s permanence and solidity was important, it was placed on a pedestal creating a separation between the place the viewer exists and the place the sculpture exists. Modernism sees the sculpture brought down from it’s pedestal or the pedestal is incorporated into the sculpture itself. Both Gioni and Krauss draw attention to Constantin Brancusi’s “Endless Column” as a seminal work in this era. Not only was the work autonomous and free standing it also was non site-specific and was made a number of times in different materials and scales in different spaces; in several cases actually becoming hugely monumental. The monumental was still present when sculptural work moved in the Expanded Field. Many of those works – particularly the site construction and marked site works – were hugely ambitious in scope and size. In the 1960s Minimalist sculpture still held onto the monumental through it’s extreme manufactured, artificial appearance and use of industrial materials. Gioni also includes installation work in his assessment of the monumental through it’s often grandiose experiential qualities. It seems that this form of object-making has been born from an affluent world exhausted by commodity and filled with refuse. (Gioni points out that this art practice is mainly found in the US and Europe). It is not a collective or cohesive creativity, it is not concerned with relational aesthetics, it is brought together more by an interest in incorporating found objects, secondhand images, detritus and waste items. It has strong ties to the Arte Povera movement with it’s anti-establishment, nonconventional desire to break down the barriers between ‘art’ and common items. While reading this book I was drawn to the work of Matthew Monahan. 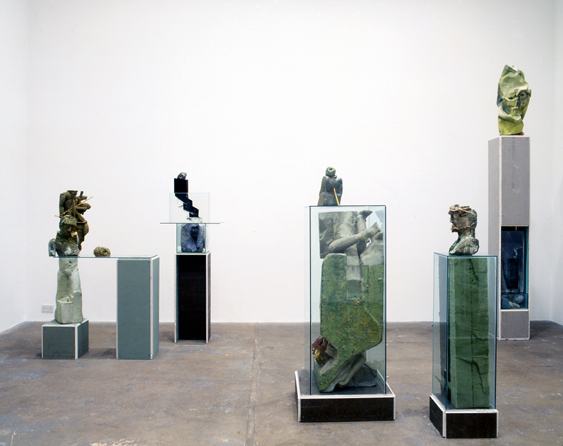 His work incorporates plinths and glass cases that harken back to the classically monumental; the classic form of sculpture as artefact of remembrance and the plinth and case as display methods separating the art from the viewer. 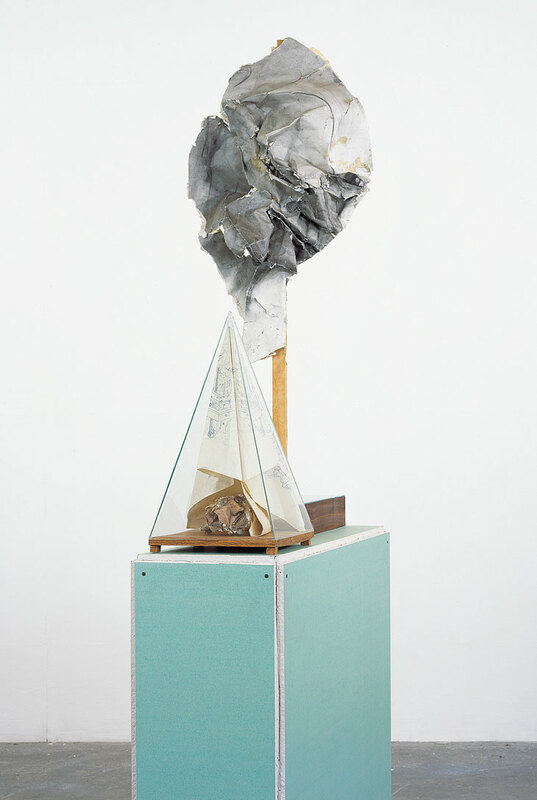 Monahan’s work defies the monumental in part by it’s use of material and in part by it’s quiet, reflective nature. I love the drywall used in the plinth-type structures, the way the edges crumble, the way it’s tacked together, the bright colours of the surface and the stark white of the interior, how it looks like it’s just offcuts from a building site that have been pulled out of a bin. I also love the rather random, found, broken nature of the objects that are ‘displayed’ upon the plinths and within the glass. Some of them have an almost traditional bronze, ceramic or stone sculptural quality but are distorted or broken, combined with bits of this and that, both venerated and degraded. They remind me of personal reliquaries where various treasures are collected and stored, they have private significance but their specialness might not be understood by anyone else.